My bedroom has undergone a makeover recently. In today's post I would like to show you what my workspace looks like. The intention was to create clear and practical workspace. 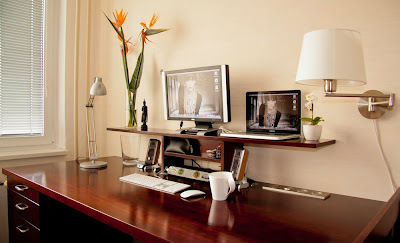 The custom-made desk has many built-in features that were needed because I use both Mac and PC. They share the monitor BenQ, keyboard and audio system. One can switch from one to another using the Belkin switch. Simply put, it's pretty awesome. 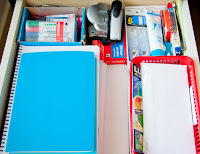 Moreover, I would like to share with you some tips on organization of drawers. 1. Everyday items belongs to the first drawer. The most simple rule that you can obey. 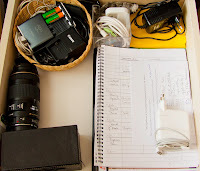 You can see that in the first drawer, I keep not only pencils, but also post-it paper to make quick notes, charger for my iPhone and hand cream. Think of items that you use everyday or you should use everyday (such as hand cream). Ideally, when setting up your workspace, leave this drawer empty at the first place and during next week or two, start adding recently used items to it. See that little red basket? That is my inbox for bills, incoming mail or other things that needs my attention in near future. By keeping them in my inbox I ensure that I would not loose them somewhere. Small inbox is much better than a big one for several reasons. First of all, it gets full earlier and consequently catches your attention earlier. Second of all, when you try to deal with all those papers, you would appreciate that it is just a small amount of things to deal with and you will be done with it much more quickly. 3. Keep your chargers close & make some space for everyday papers. Making some space for small amount of papers that are used everyday is also a great idea. When visitors come in, you would probably like to hide what you were working on and enjoy a cup of coffee with them. In the situation when you do not have a space where to hide those papers, they are very likely to end up stuffed somewhere, creating clutter. 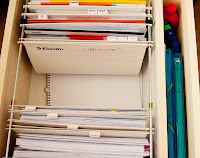 Therefore, avoid creating clutter by designating small space for those papers. 4. Filling file is necessary. For what? The answer is: for everything. Bills, drawings, notes, all the paper clutter you have. Once or twice a year, revisit your filling file and throw out all the papers you do not need anymore or archive them. That is the only way you can to keep your workspace free of paper clutter. How do you deal with paper clutter? Share your experience with me in comments. Nice that you are featured on lifehacker. Where did you purchase your desk at? I like the built in powerstrip. Excellent post. What is that wallpaper that you are using? I really like the style of this. At night, this probably looks phenomenal. Regarding paper clutter, I got a Fujitsu scanner recently. Now I just scan all the bills, papers, etc and shred the stuff I don't need to keep. 90% reduction in stored papers. Fantastic device. Mike, the desk was designed by me and custom-made by carpenter. the powerstrip is huge help and it's a component available in online stores, I think worldwide. Gratz on the lifehack, love how clean your design is. Btw what kind of wood did you chose, and what finish did you use? Do you have a make, model, or website for the power strip? I've looked high and low without luck. All I find are the ugly corporate flip up models. I love your desk and the drawer descriptions. Great design. it would be great if you could publish a photo of the hardware used for your piano drawer.